Clare Marie Helnik (Nee Perry) passed away on Wednesday, March 27th at 95 years of age. She was born on May 28, 1923 in Oconto Falls, WI to Clarence and Julia Perry. She was united in marriage to Walter (Wally) Helnik on October 1, 1948 for 62 years, up until his death on December 25, 2010. Clare’s life will always be cherished and honored by her surviving family which include her two daughters, Linda (David) Axtell and Marsha (John) Fuchs; three grandchildren, Tiffany (Jennifer Jackson) Valona, Jillian Axtell, and Alexander Axtell; sister Kris (Michael) Eckes; nephews James (Donna) Eckes, Lonny Eckes, and Nick Eckes. She was preceded in death by her husband Walter, her sons James and Michael, and parents Herbert and Julia Krueger. Clare had an infectious smile, a great love for all animals, and a deep appreciation for the beauty of the northwoods. She was an avid crafter and gardener and had a passion for cooking. Clare had a strong work ethic. She and Wally ran the Golden West in Pound, WI for nearly 20 years, retiring in 1995 on Shay Lake. 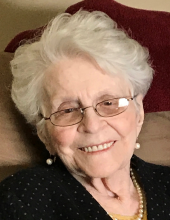 The family would like to extend their gratitude to the caregivers for their compassion, friendship, and skilled assistance, as well as Ascension Hospice for making Clare’s final days comfortable and peaceful. A memorial service will be held at St. Anne Catholic Church in Coleman on Friday April 5th, with visiting time for friends and family from 10-11 AM to time of service at 11 AM. In lieu of flowers, memorials may be made to the Alzheimer's Association. To send flowers or a remembrance gift to the family of Clare Helnik, please visit our Tribute Store. "Email Address" would like to share the life celebration of Clare Helnik. Click on the "link" to go to share a favorite memory or leave a condolence message for the family.